The slow dance of the flurries mesmerized the prince. His strength almost spent, he glimpsed a light in the distance and lurched toward it. Finally, he reached a small hut. He pounded at the door. It opened with difficulty, for the snow had banked against it. A witch stood on the threshold. She was a paragon of ugliness. She opened the door wider. The prince staggered inside, and fainted. When the prince awoke, he lay under a quilt on a pallet before the fire. The witch sat reading in a worn green damask armchair, her knees tucked up to her chin. She was so engrossed in her book she didn’t notice he’d awakened. That gave him time to study her. Her hair straggled in wild wisps, dark cousins to the straws in the broom she no doubt used for flying. One green eye wandered a bit right, one brown eye a bit left. Above them, tufted eyebrows formed a single formidable shrubbery. Her chin ended in a hilly promontory, capped with a wart. The witch yawned, revealing teeth reminiscent of Roman ruins. She bustled about for a bowl and a spoon. From the cauldron that bubbled on the hearth, she ladled a generous helping of lentil stew. She also handed him a slice of brown bread and a cup of water. The stew was filling but it had a gluey consistency and burnt pieces had been scraped up from the bottom of the pot. Hungry as he was, he had difficulty swallowing it. The bread was hard and yeasty. The witch waited for him to finish. He held out his bowl for seconds. He didn’t wish to appear rude. And he really was starving. “You are most kind.” The prince gave a courtly nod. A white cat leapt onto Alban’s lap. He winced as she kneaded herself a comfortable seat. Nougat did precisely that. In no time at all she was purring soundly. And Prince Alban was fast asleep. Hours later, he woke. 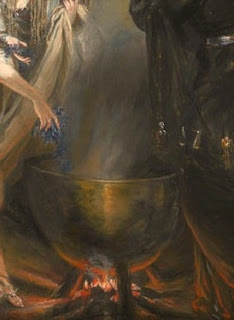 The witch sat at a claw-footed table, mixing something in a pink bowl as she scowled over a recipe. The shelves behind her were crowded with ceramic jars. Dried herbs hung from the rafters like cheerful nosegays. As the prince stirred, Melligar looked up, those odd eyes magnified owlishly by the spectacles. If she had hooted and flown up to the rafters, he wouldn’t have been surprised. “I think so.” He began to rise. “Steady,” she said. She placed one arm around his waist to keep him balanced and pulled him up. How boney she is, the prince observed, and yet how strong. He felt slightly dizzy as she led him to a tapestry-backed armchair opposite her own. The bold design of tulips and poppies had faded. Loose threads trailed under the seat, probably the work of Nougat. It was very comfortable. “You don’t happen to play chess?” Melligar asked. “Why, yes I do,” he answered. The witch set up the board on a small barley-twist table. They played until the sky outside the window turned dark again. “Check-mate!” Melligar crowed. Her nose wobbled as she raised her arms and hooted in victory. Again, Alban waited for her to flap away on owl’s wings, and was disappointed. He didn’t mind losing. It was a new experience. He suspected that sometimes his opponents had handed him the victory in deference to his rank. She brought him what he needed and returned to her potion. While Alban stitched, the witch ground herbs in a green-veined mortar or mixed the bowl’s contents with her wooden spoon. Part midnight-blue velvet, part brown wool, the prince’s mended doublet would have scandalized the court, but at least he’d be fully dressed now. Melligar put down her spoon with a thump. She knocked at the table twice and twice again, her eyes scrunched tight. Blue flames issued from the bowl. The witch held up her hands, commanding them to wait. She opened the window, puckered her lips and blew towards the flames, mumbling an incantation that Alban strained to hear. A heavy purple smoke replaced the flames and drifted towards her. She gestured it out the window. It obeyed her and was gone. The witch opened an imposing black cupboard guarded by carved griffins. She took out a cornetto. Alban had never seen a lady play one. But then, he thought, giving her a sidelong glance, Melligar was like no lady of his acquaintance. She raised the curved black instrument to her lips. He thought she would play a brisk bransle or salterello. Instead he heard “O Rosa Bella,” a melancholy air he’d always loved. The second time through, she changed its character with ornaments as intricate as palace embroideries. “You wouldn’t happen to play anything yourself?” she asked. “I’m sure you could.” From the black cupboard she retrieved the old-fashioned instrument. Although it had been banged about a bit, it was pretty, with a carved rosette over the sound-hole. Alban balanced it on his lap. A psaltery is all blunt edges, he thought, whereas a lute’s curves fit as obligingly against a man’s body as a woman. Well, he glanced at his scrawny hostess, not every woman. “Do you have the key?” He plucked a would-be scale to demonstrate how woefully out of tune the strings were. Melligar rummaged through the cupboard. She searched the hut, throwing things out of drawers and letting them lie wherever they landed. Alban joined the hunt. At last he found the tuning key in a pile of chisels, files and other tools piled on the floor near a bushel of onions. After Melligar showed him which strings were which, the prince tuned the psaltery to her cornetto. He experimented by plucking a few tunes. It had a rather sweet sound. He did. In no time, they were playing duets. And so the days and nights passed. Alban and the witch played chess or made music. Melligar allowed the prince to sample freely from her book collection which contained history, botany, poetry and other interesting subjects. He left alone the dark volumes on the shelves near the ceramic jars—those with no titles on the spines. These he assumed formed her professional library. From time to time, the witch attended to various spells she had contracted to do in the fall. Sometimes she and the prince conversed about what they read, or about art or philosophy. “I’m on a quest,” said the prince. Now, Melligar had fallen in love with Alban the first week he arrived. Help him seek another woman? How could she do that? Despite her dealings in the fantastical arts, she was a practical person. She knew that while it was probable for a woman like herself to fall in love with a man like Alban, it was utterly impossible that a prince like Alban would love a witch like her. She’d fallen hard, as people do who discover love late in life. True love, however, seeks the beloved’s happiness, and Melligar had a generous spirit. “I can’t promise anything,” she said the next morning, “but it’s worth a shot. The way to go about this is to conjure an illusion of the woman you were meant to love. It won’t be easy. But if we can create her image, it means that such a woman does exist. And therefore, love is possible for you. Alban obeyed. It felt rather silly, but he remembered his goal and grew earnest. Awww, thought Melligar, he looks like a child wishing on his bedtime star for a pony. “Open your eyes,” the witch commanded. He nodded. Alban respected the mysteriousness with which she spoke; perhaps her mumbled incantations sounded like that. They retreated into their separate books, Alban because he didn’t wish to ruin the solemnity of the moment, Melligar so she could begin to school her heart in denial. Over the next three days, Alban thought constantly of his hoped-for Beloved. She peered over his shoulder, making him lose at chess and play false notes on the psaltery. Eventually he dreamed of Her. Her image altered constantly. No matter what form she took— black-haired, dark-skinned and voluptuous or blonde, reed-thin and pale—he always recognized Her. On the third day, Alban rose at dawn and dressed. While he waited for Melligar to awaken, he twanged on the psaltery and sang more loudly than was polite at that hour. She staggered out of her bedchamber, disheveled and blear-eyed. “I suppose you’re waiting for me?” She yawned. “How will I know what to choose?” Alban cried. Alban drew his chair so close to the hearth that his face beaded with sweat. Soon he stood up, smiling triumphantly. At first Alban felt offended. But when he thought about it, the combination did sound like a trite poem. Melligar consulted her grimoires; Alban consulted his heart. A few hours later, he returned to her. Her owl-eyes peered at him over her tome. While Alban went out into the snowy woods to gather oak branches, Melligar took down a jar of rose petals and cut sage leaves from a bunch hanging from the rafters. She filled her empty cauldron with water; luckily they had finished the latest batch of stew. When the prince returned, the witch threw in the ingredients and began to stir. The hut hadn’t improved since Melligar had started rummaging through her more obscure books to find the right spell; they lay helter-skelter on every dusty surface. Alban had never seen her take the broom out for flying or anything else; it stood propped in a cobwebbed corner. Alban gathered scribbled drafts of spells, which littered the hut like autumn leaves, and scooped up amulets by their chains, careful that no lingering magic rubbed off on him, and stashed them in the black cupboard. He was resting by the fire with his Ariosto when Melligar joined him. He looked up hopefully. “Relax. We’ve got hours before we’ll see any results.” The witch moved the heavy cauldron onto the hearth. Alban leapt up to help. His stomach growled a reminder that dinnertime approached. But there sat the cauldron, filled with his potion. Alban rolled up his sleeves and went to work. Melligar’s winter larder possessed salted cod and pork, the remains of a smoked ham, various cheeses, and an abundance of fruits and root vegetables. The adjacent shed housed a cow and some chickens. That evening, the prince and the witch dined on roasted pork in spiced wine with generous helpings of frumenty and fried parsnips. Sated, the pair sat quietly at the table. Alban’s thoughts centered on his unknown Beloved. Melligar sighed and wore a pained expression. She often reached a hand down her boots to rub her feet. The prince realized he’d never seen her without them, although they’d established the informality people get when living in close quarters. “Do your feet hurt?” he asked. She hesitated, then bent down and untied the laces of her boots. She tugged her feet free. Alban turned to afford her some privacy as she rolled down her hose. When he turned back, her face wore a blissful expression. Her legs and feet were bare—if “feet” was the proper word for them. From the calves down, her legs were covered in amethyst scales. Her toes ended in saber-sharp claws. They were dragon feet. Alban could well imagine how ordinary boots would cramp them. Alban searched among her tools and brought them to her. She struggled to trim her claws, but couldn’t find the right angle. “Allow me,” the prince said. He moved his chair closer to hers. He placed one of her feet in his lap. Combining delicacy and strength, he trimmed them to a manageable length. He ministered to the other foot. The prince thought the witch trembled at his touch, but since she was no coward, he dismissed the suspicion. Melligar withdrew her foot, straightened her skirt and sat up. “The potion should be ready,” she said quietly. The prince took one side of the handle and the witch the other. They walked slowly, their steps in matching rhythm. They hoisted the heavy pot onto the table. Melligar sat down before it. Alban took the chair opposite. The witch threw a few powders into the cauldron and stirred. Alban craned forward, his hands clasped together. The witch scrunched her eyes tight. She stamped twice and twice again. Stirring all the while, she mumbled an unintelligible charm. Steam rose before her. Alban held his breath. Melligar opened her eyes. She fastened them on a spot to her right. Its vacancy disappointed her, the prince could tell, even before she shook her head. She hauled the cauldron off the table, opened the door and dumped its contents outside. Alban heard his heart’s dream sloshing out like so much slops. They took their places at the fireside. “I have an idea,” the witch said at last. She muttered a charm. A fine white stallion appeared, swishing his tail. Alban stroked the phantom horse’s forehead. It nuzzled his neck in return. Slowly the image faded, then vanished altogether. Quick as a wink, Melligar stamped her feet. Up popped a red pony the size of an otter. All evening, the pony performed tricks for them. They laughed as it played hide-and-seek with Nougat and read lines from Orlando Furioso, although Alban’s laughter was tinged with melancholy. The next day they tried a new recipe. “Roses for beauty, apples for love, lavender for gentleness,” the prince declared. “All tried and true ingredients in love potions,” the witch approved. While Melligar chanted at the cauldron, Alban swept and dusted. He cleaned the carved griffins on the black cupboard so their feathers gleamed. Hours later, when the witch clapped her hands and opened her eyes, she found no spectral presence beside her. She and the prince ate a wordless dinner of cod in an almond cream sauce. The following day, while the witch worked at her cauldron, the prince mopped the floors. He baked a rosemary and garlic focaccia. He slaughtered one of the chickens and plucked it clean. This potion also failed. Were it not for the chicken in a galantine sauce, followed by pears stewed in sandalwood and wine, it would have been a glum night indeed. Every day they attempted a new recipe. This new phase gave the prince a renewed sense of purpose. True love can’t be rushed, he told himself. I have till spring. Faint heart never won fair lady! He and the witch tried gentian, basil (which also worked nicely in a mushroom tart) and roses. Catnip (sampled by Nougat, to the detriment of the tapestry-backed chair), ivy and roses. Love-in-a-mist, cloves (which also spiced up the last of the ham) and roses. Lemons, ginger and chestnuts—no, that was a dessert. One afternoon, after he’d chopped the ingredients for a mushroom, brie and leek pie, Alban heaved a deep sigh. “Losing hope?” the witch asked. “Just a little cabin fever,” he answered. “It’s certainly not the company that’s lacking, dear Melligar! One longs to stretch one’s legs, have a change of scenery. Though, true,” he chuckled, “I wouldn’t mind if now and then I could find myself alongside an affectionate, attractive blonde.” He bit his lip. He hadn’t meant to be ungallant; he tended to forget that Melligar was a woman. She was his friend—the best friend he’d ever had. “Say no more,” the witch said without a trace of offense. She scrunched her eyes tight and stamped twice and twice again. A pair of expressive brown eyes met Alban’s gaze. They belonged to an astonishingly beautiful blonde—spaniel. The prince guffawed. He patted the dog, who wagged her plumey tail so hard it chilled the room. Melligar clapped twice and twice again. The hut extended into a park gorgeous with June roses. Alban stood up. The spaniel eyed him expectantly. “Aren’t you coming?” he asked the witch. “Like a hen on her eggs. Come on,” he urged. “You deserve a day off.” He held out his hand. When she took it, he pulled her from her seat. How light she was! Though considerably less so since Alban had started cooking. They walked into the garden, the dog sniffing ahead. That night, as he lay on his pallet, Alban mused over his conversation with Melligar. He never did miss other people. He treasured their chess games, their duets, their arguments over Aristotle. It saddened him to think that, come spring, he would never see her again. And spring was hastening on. The prince sat opposite the witch at the claw-footed table, the cauldron between them. She stirred the day’s brew, awaiting the final judgment. The steam billowed as usual, obscuring Melligar’s face. This time, though, Alban could have sworn her carrot of a nose straightened and shortened. Could this be the first glimmering of a working potion? Alban took a deep intake of breath. Good heavens. Two green eyes, perfectly focused. Perhaps she labors under a curse, he thought. The true Melligar is breaking forth from the prison of her ugliness. Wouldn’t it be wonderful? Yes! A woman just like Melligar, only beautiful, would be perfect. “I’m afraid I’ve always looked like this.” She sighed. The daily contact, the obsessive concentration on love, chafed far worse than her boots ever had. Would spring never come? What, she thought, was this new nonsense about her face? A wave of tenderness overtook her; perhaps the strain was getting to him. “Are you feeling all right?” she asked. She moved her head from the cauldron’s steam to see him better. When he looked at her again, her face—alas—appeared the same as always. It must, the prince figured, have been some distortion from the steam. The odd illusion puzzled him. What could it mean? Clearly it had something to do with his potion. Did his quest lead to Melligar? She must be a lovely woman he was meant to free from an enchantment. Meant to love. “Rose petals. Honey. And vinegar,” Alban declared the next day. Two hours later, when he stared at his companion through the cauldron’s steam, he detected two trim eyebrows. The charming nose and green eyes reappeared. Surely the spell was working! Alban was on to something. But when she stood up from the table, Melligar looked just as she had all winter. What had gone wrong? And what had gone right? That night, after Melligar went to bed, the prince stared hard at the fire, seeking an answer. His gaze wandered beyond the flames to the floor of the hearth. Tomorrow he had better sweep it. A pile of ashes, higher than the rest, congregated in the center. His eyes traced the pattern they made. Circles within circles, slightly off-kilter, like the petals of a rose. Rose? The one ingredient he had clung to steadfastly for the potion. Was that preventing the spell from working? In the old tales, you chose the wooden casket, not the golden one, to win your treasure. He stirred the ashes while he thought this out. He must give up beauty as a requirement for his Beloved. Once he did, Melligar would be free of the curse. If she weren’t the most gorgeous woman on earth, what would he care? As long as she was mildly pretty, he’d gladly clasp her in his arms. Before he knew it, he’d stirred the ashy rose out of existence. “What’s today’s recipe?” the witch asked the next day, irritation creeping into her tone. Truly, she needed Alban gone. Intent on his stupid potion, she never went outside any more. Her mind churned constantly, flung between unrequited love and daily failure. Soon she’d lose all ability to work a spell. “Honey. Vinegar. And lady’s mantle,” Alban answered with a quickly beating heart. The cauldron boiled away on the hearth. Alban prepared pork and currant tarts. The pair ate. They returned to their chess game. Melligar chanced to look out the window. A moment later she raised her head. “Winter has really dug her heels in this year,” she observed. At last, they sat opposite each other with the cauldron between them. Alban glimpsed a fair face, free of spectacles, framed by auburn locks. No doubt he’d gotten the potion right this time! How deep his disappointment when the illusion dissipated with the steam. That night, the prince again sat sleepless on his pallet. Why hadn’t the potion freed Melligar from her curse? She did say she had always looked that way. So the curse was just something he’d wished for. Then what was the meaning of the steam’s illusions? He thought again about the old tales. The wooden casket never turned to gold yet it always held the treasure. Could Melligar in all her ugliness be his treasure? Surely he couldn’t love the witch as she was. Could he? Soft skin, a lovely face, a lithe body—he sighed—he could dispense with more easily than a quick wit, a good heart, a ready laugh. Someone who could surprise him. Alban baked the parsley bread that would accompany the evening’s cod in saffron and ginger. For dessert they would have rose-hip pudding with minced dates. He sat in his tapestry-backed chair, the psaltery on his lap. He no longer minded its sharp edges. He tuned the strings while Melligar, in a sour humour, gave him his notes on the cornetto. It took him a while to re-tune his B-flats to B-naturals. Melligar’s eyes strayed to the window. She headed towards the door. With a grunt, she pulled them on. Once she gets outside, she’ll know I’ve lied, Alban thought. All will be lost. If only I could spell away the spring. Had he not lived all winter long with a witch? While Melligar bent to tie her laces, Alban faced the other way. He scrunched his eyes tight, then stamped twice and twice again. He’d never been able to catch any of the witch’s incantations so he whispered what might have been a charm but felt like a prayer. She grabbed him by the hand and dragged him outside. The forest shivered under a blanket of snow. A rough wind carried new flurries in it. A cardinal in the cherry’s bare boughs puffed himself up for warmth. He swirled her in his arms and deposited her on his bent knee. “Stop being silly,” she protested. “This is ridiculous.—Improbable? But possible?— Are you delirious? Oh, my darling boy!” She felt his forehead, certain she’d find it hot with fever. “Why, you already love me!” the prince exclaimed. “Here is all the cure I need,” the prince said and, bravely keeping his eyes opened, he kissed her. The small part of him that persevered in the hope that her ugliness might lift at true love’s kiss now lay down its sword and crept away. Melligar didn’t change. If Alban were to love her, he would have to take her, mismatched eyes, warts and all. It was not, he discovered, a bad kiss. She whistled. The blonde spaniel bounded after them as Alban took Melligar’s hand and led her beneath the cherry tree into the spring forest. Sandi Leibowitz writes fantasy fiction and poetry, often based on myths and fairy tales. Her fiction has appeared or is forthcoming in Jabberwocky, Cricket, Shelter of Daylight, and Shining Cities: An Anthology of Pagan Science Fiction. Her poetry may be found in Goblin Fruit, Mythic Delirium, Strange Horizons, Eternal Haunted Summer, Niteblade, Silverblade and elsewhere. She performs early music (including limited plunking on the psaltery) and sings with Choraulos, Cerddorion, and NY Revels. A native New Yorker, she shares her aerie with some ravens, two ghost-dogs and the occasional dragon.